The former BBC space is being converted in the Hacienda Beer Co. taproom and restaurant, slated to open May 24. Published April 9, 2019 at 10:01 a.m. 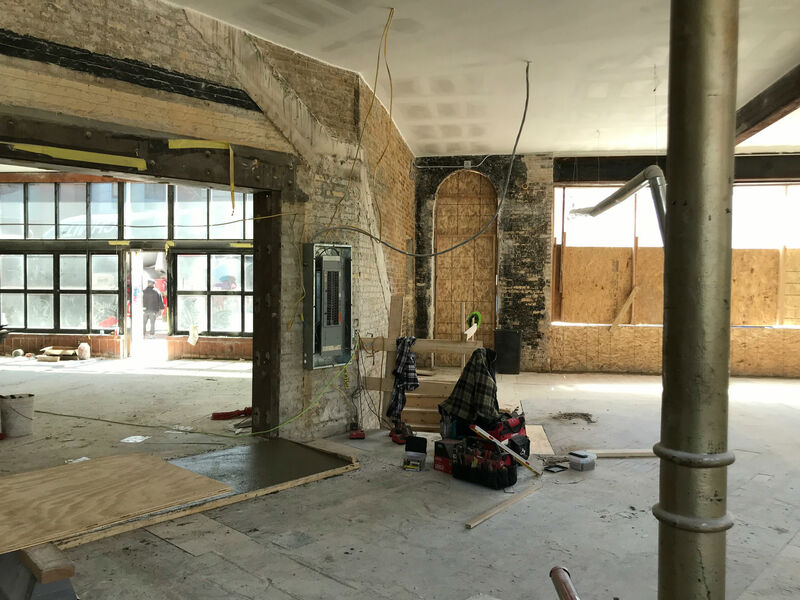 Door County's Hacienda Beer Co. is aiming to open its taproom on Farwell and North by Memorial Day weekend and so crews are working hard to whip the former G-Daddy's BBC space into shape in time. According to General Manager Jayk Burczyk, Hacienda Beer Co. Milwaukee will open to the public on Friday, May 24. Soft openings, by invite only, may take place in the preceding days. Hacienda was launched by Danny and Ben McMahon and Allyce Mohs in 2017 as "an experimental brewing project" of Door County Brewing Co., which was founded five years earlier in Bailey's Harbor by the McMahon brothers and their parents John and Angie. "Hacienda was their attempt at doing more experimental stuff," says Burczyk. "(Danny) wanted to try a lot of East Coast hazy IPAs, milkshake stuff, juicy IPAs .. things that are really popular out there. Door County was doing kind of more straightforward stuff. "Hacienda has been around for a year now and it's really, really taking." Door County Brewing has a 15-barrel brewery that brews both brands' beers. The Door County taproom in Bailey's Harbor also serves Hacienda brews. 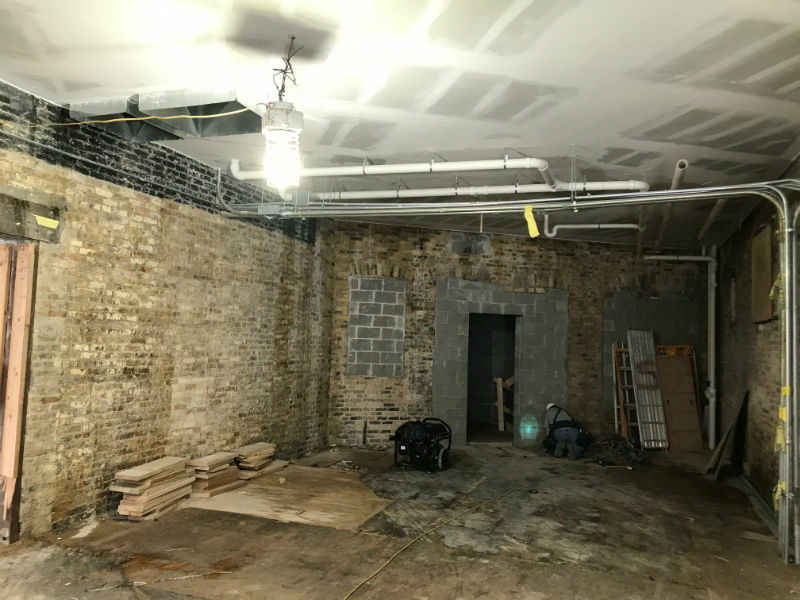 The Hacienda Milwaukee taproom, 2022 E. North Ave., will offer about a dozen beers from the Bailey's Harbor brewery on tap and will also fill growlers and sell four-packs. There will be a kitchen, and live music on tap, too. "They're two different brands, though Hacienda is obviously a big part of the operation up there now, as well," says Burczyk. "We're going to look a little different as far as color palette. A lot more vibrant ... the colors are really going to pop." Renderings of the space, designed by Milwaukee-based 360 Degrees, show a range of earth tones contrasted by the exposed cream city brick walls and accented by big hanging orbs of light. Milwaukee developer Josh Jeffers bought the building – actually, a complex of four connected buildings – which housed BBC for more than two decades, a year ago for $1.5 million. Soon after, we took a peek inside with Jeffers. 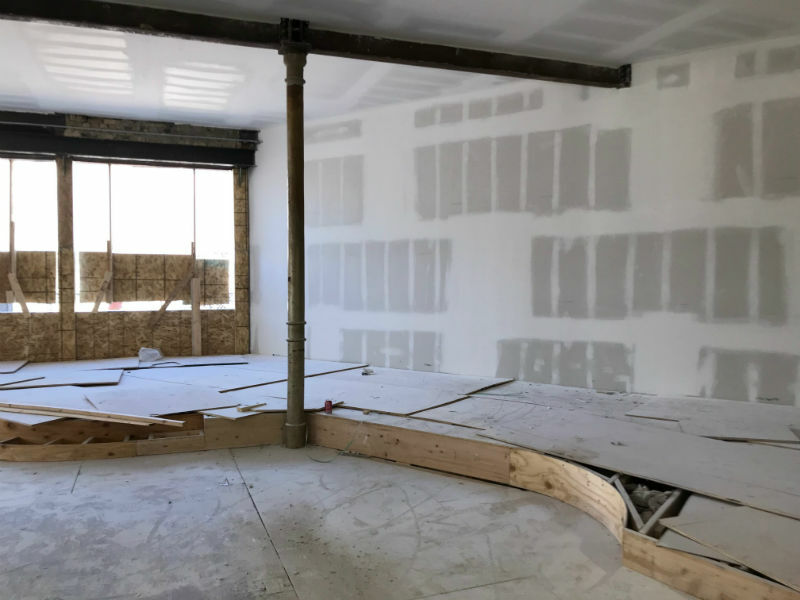 We got a progress report tour of the space this week from General Manager Jayk Burczyk. 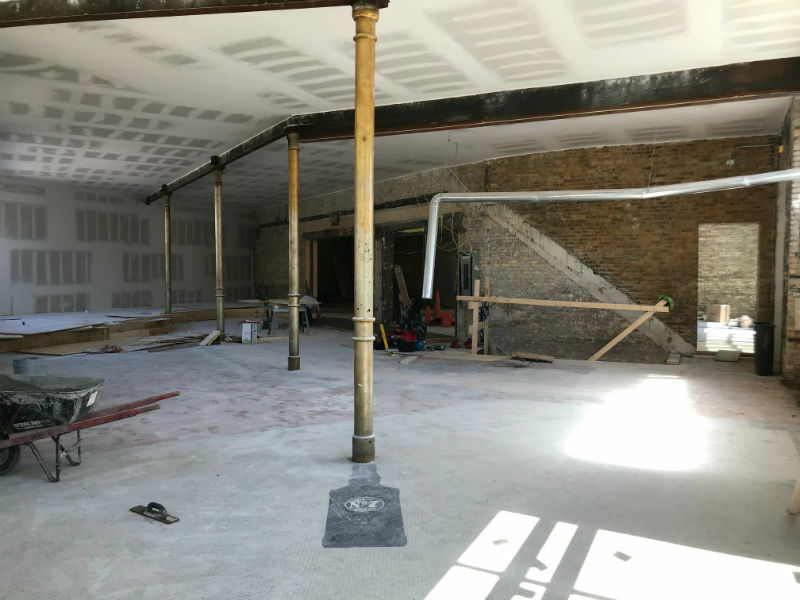 He showed us the stage, at the north end of the main room – which will have table seating when there aren't performances in progress – and the back of the space to the east, where the kitchen will be. 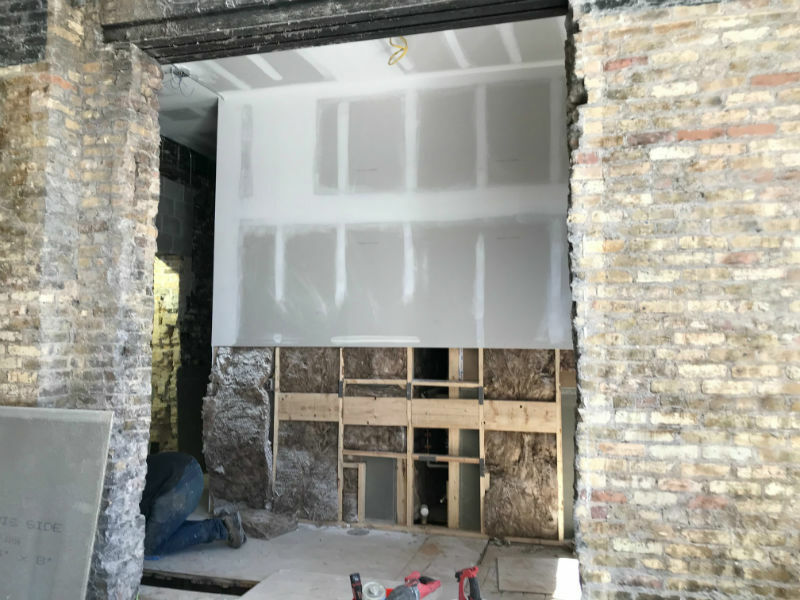 The bar will wrap around a wall from the west room to the middle space, with new steps to the basement behind the bar, allowing access to the huge new basement cooler. Much of the rest of the space will be dedicated to table seating, including a series of big curved booths along the west wall. Burczyk said a new garage- or accordion-style door will open during nice weather allowing access to the sidewalk seating along North Avenue. There may also be seating on the Farwell side, but that's not yet certain. He added that in year two, Hacienda hopes to open a small rooftop patio and there's the potential that the taproom will expand to the second floor, which is currently vacant and advertised as potential office space. Burczyk says that Hacienda may not stop at Milwaukee when it comes to taprooms, but it is definitely the first attempt at a taproom and, especially, a full-on restaurant. "They looked at a few places," he says. 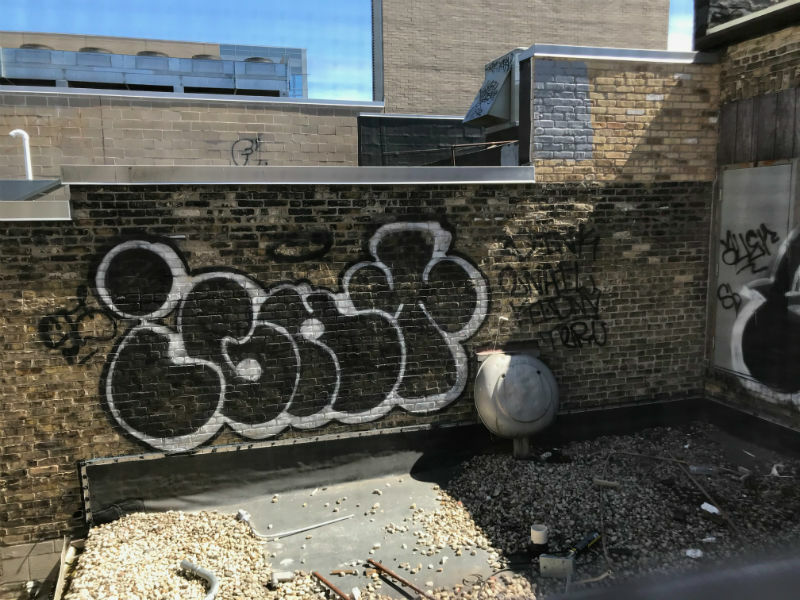 "I know they looked in Minneapolis; they were really almost pretty dead set on Madison for a minute and then ultimately looked in Milwaukee and found several spots and landed on this, which I think is great. "This is the flagship. I know there was discussion about opening several of them, but right now it's the focus." Formerly of Circa 1880 and Hotel Madrid, Manuel Torres is perfecting the menu and will helm the kitchen. "We're still curating that menu right now," says Burczyk, "(but) it's not going to be pub fare. It's going to be very interesting. "There's a baked cheese curd tapenade with olives and cheese curds, and then he cooks it in the oven for eight minutes to brown it. It's served with crostini and it is mind-blowing." Hacienda will be open for lunch and dinner, says Burczyk, who expects the place will be a destination as much for diners as for beer-drinkers. "Food is going to be vital to this process, and making sure we have a good, interesting menu," he says. "We've been looking around at (what) our neighbors (are doing), because we don't want to step on anyone's feet. We want to try to do new things and be unique. If we're all making burgers like Hooligans, what's the point?" While the space is clearly coming along, to the untrained eye it looks like there's still a long way to go. But Burczyk – who has helped open a number of bars and restaurants, including Red Lion Pub and Fuel Cafe on 5th Street – seems unfazed. "We are going to make it," he assures. "Everything's been good. As long as all of the licenses come in and the health inspection is good I think we'll be alright. We've already staffed 30 people and we've got two months to go. It's a good feeling to know you're checking boxes way earlier than you expect. "I think it's going to be completely awesome for the neighborhood and everybody seems really excited about it."